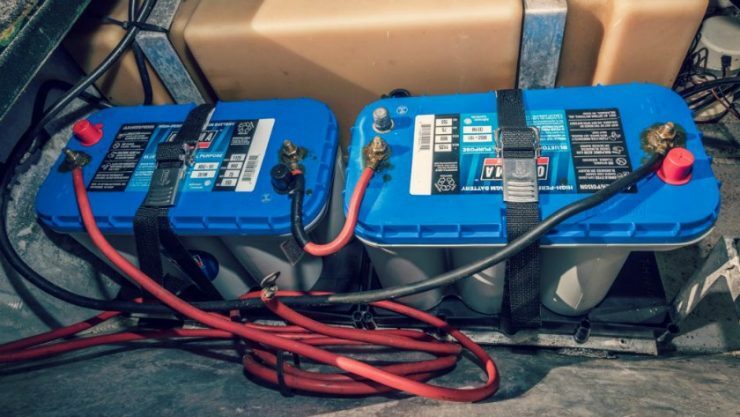 One of the most important pieces of equipment on your fishing boat is your batteries. Marine batteries can be an expense, but it’s not an area anglers should look to scrimp. Without quality trolling motor batteries, you can find yourself out of power at an inopportune time. Nobody likes having to end their fishing day early due to dead trolling motor batteries. The good news is that today’s AGM trolling motor batteries are better than ever, with more capacity and less maintenance. Since AGM batteries are fully sealed, they can be purchased online and that will be the focus of this guide. 2. What Size Battery for Trolling Motor? What about Lead Acid Trolling Motor Batteries? How many seasons of use can I get from an AGM battery? Why are Deep Cycle batteries best for Trolling Motors? How many amps do trolling motors draw? How long can a trolling motor run on a deep cycle battery? What kind of charger do I need for AGM trolling motor batteries? How important is a Battery Warranty? How do I find what Group Size my Old Batteries are? Are AGM batteries worth the price over Wet Cell? 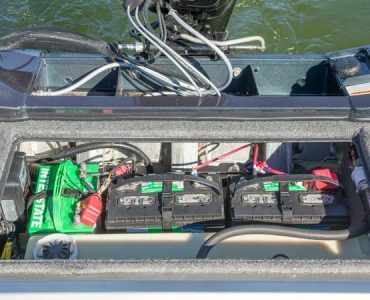 Even though batteries may seem like a simple and straightforward purchase; if you want to find the perfect one for you and your boat – there are a few things you should know. In this article, we’re going to cover all the critical factors that make a great trolling battery. Lead acid batteries are what you get used to hearing about. These use an electrolyte (usually water) to flood the lead plates, and as a result are very heavy. These batteries also require maintenance because you have to monitor the fluid levels and check for corrosion. These batteries can be known to have vibration problems which reduce the overall life of the battery. All in all, lead-acid batteries are the norm, but they tend to have a shorter life compared to AGM style marine batteries. Your trolling motor determines what size battery you need. It’s important to know what group size battery you need. If you do not have the right battery, you may not have enough power to turn the motor over, and you could find yourself stuck out on the water. For good run-time, you want to have a group 24 battery that gives you 70-85 amps per hour at 12 volts. This battery works well for smaller boats. For better run-time, you want to have a group 27 battery that gives you 85-110 amps per hour at 12 volts. This battery works better for bass boats. For the best run-time, you want to have a group 31 battery that gives you 95-125 amps per hour at 12 volts. This battery works great for larger bass boats. The amount of reserve amp draw is an essential factor to consider when choosing a battery. Reserve Capacity is the amount of time you have until the battery falls below the minimum voltage. Every manufacturer has a different kind of warranty. Some companies offer ten-year warranties, some provide lifetime warranties, and some only offer two or three months. You want to make sure to protect yourself and go for a battery with a decent warranty. Of course, it’s important to look at the reviews and consider the average life of a battery vs. the warranty, but you should go for a battery with a good warranty. When choosing a battery, it’s equally as important to select a good charger that is compatible with the battery you are using. Selecting an onboard charger that does not work well with your battery will not only cause you to get less time out of each use, but it’s also going to shorten the life cycle of your battery because you have to charge it more often. If you are going to invest in a good battery, you should make sure to budget for an excellent charger to pair with it. This choice will ensure you get a good life out of your battery. If you are undecided between a name brand battery or an off-brand, look at the reviews and get opinions from other people. Just because something does not come from a major manufacturer does not mean it is not as good. If you look up an off-brand battery that is forty dollars cheaper than the name brand and it has fantastic reviews and a good warranty, I’d go for it. The saying “the bigger, the better,” is right when it comes to marine batteries. More weight equals more lead in the core. More lead in the core means a longer run time and, in the end, – the longer you run your battery without charging the better chance you have of extending the life of the battery. 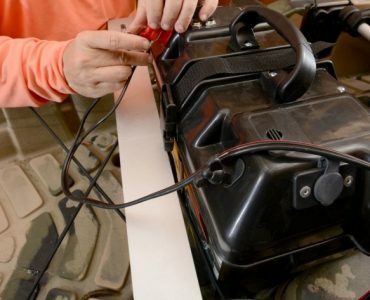 The only downside to a larger battery is carrying it around, but if you have a place to store your boat where the battery won’t be constantly exposed to the elements, you might be better off going for a larger battery. This is the best trolling motor battery for the money. 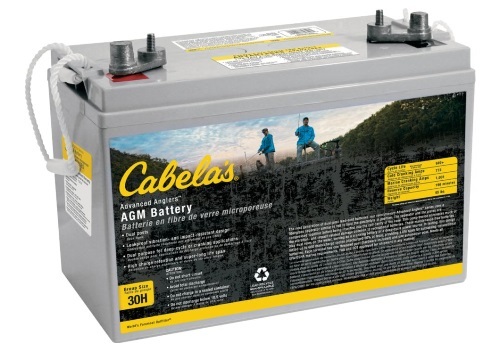 The Cabela’s is a pure lead AGM battery with a significantly faster recharge up against the competition. This battery cycles up to 900 times at 50% discharge and ranges from 1,010 to 1,370 marine cranking amps. The manufacturer also offers a nice four- year warranty on the battery. Since this one is designed with AGM technology it requires very little maintenance, a strong powerful turnover, and a fast recharge. This is an excellent battery for serious anglers who care about their fishing. This battery will not leave you stranded out on the water. Nearly all the reviews of this battery are good. People state that the batteries last an average of 4-5 years and maintain a solid charging power throughout the length of their life. Reviewers also said that the battery charges very fast in comparison to others. One reviewer said that they ran the battery for six hours and it took 10 hours to fully recharge. These batteries are great if you are looking for a reliable battery that delivers constant results for you. This battery from Odyssey comes with a cold cranking amp of 880 and operates on average for as many as 10 years. These batteries are known for a long life cycle and low operating costs. It can get stored for up to two years without a recharge and still turn over and comes with a 4 or 4-year warranty. The battery is designed to be vibration resistant to prevent shock or unnecessary damage to the battery. This also is what extends the life of the battery. This battery has been tested in extreme temperatures ranging from -40 to 176 degrees Fahrenheit. Thanks to the AGM design of the battery, it is entirely maintenance free and requires no checking of levels or time-consuming corrosion prevention. The Department of Transportation also approves the Odyssey battery for being completely spill proof. Reviewers state that this is the best battery they have ever had for a variety of purposes. The battery has never failed and when compared to the competition, and outlasts and outperforms at every metric. You will pay a premium for that, but boaters say if you want to find peace of mind and know that you are not going to get stranded far from the boat ramp, the Odyssey battery is for you. The VMAX batteries are known for being reliable and rugged. This is the best kayak trolling motor battery due to its size and capabilities. These batteries are incredible at holding up in some of the most extreme conditions from blizzards to treacherous heat. If you deal with extreme environments or are looking for a durable battery that can withstand a beating. This powerful charge battery has a lifespan of eight to ten years. The heavy-duty grids provide extra performance and lifespan even after years of discharges. The manufacturer recommends using only a high-quality brand AGM charger for this battery. Reviews for this battery are mostly good. This VMAX battery is rugged and capable of withstanding pretty extreme conditions. Reviewers note that the battery holds a good charge and lasts long enough to stay on the water all day. This is a lightweight trolling motor battery that holds a good charge. They are under warranty for twelve months from the date of purchase. During that period all batteries get replaced. The company recommends checking your charger and panels to ensure they meet the required wattage. If that does not fix your problem, try charging the battery for fifteen hours and reading the voltage meter. It should read over 13.3V. 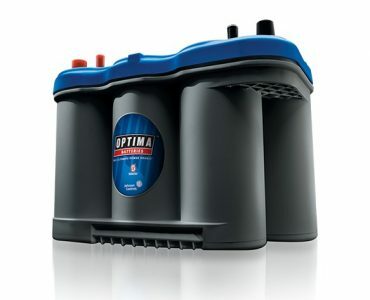 This battery is the largest deep cycle in the Optima fleet. This feature makes this battery incredibly popular among serious anglers on larger fishing boats. 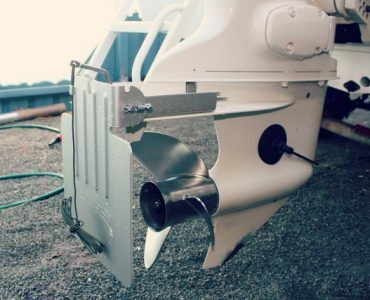 This battery has the power to turn over a larger motor among rough waters. The Optima Blue Top is also capable of holding up in extreme temperatures and for long periods of inactivity. 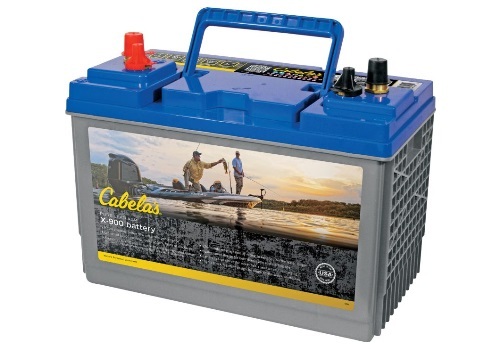 This is a great battery for someone storing their boat for the winter or fishing on the water during long, hot days. This battery has excellent reviews online. People say that the battery is great in hot weather and can go a long time between charges. Reviewers claim to get as long as 6 years out of their Optima Batteries. People also say that these batteries are great for storage because they have a low self-discharge rate, so even after long periods of non-use, they still keep a charge. We have been running the D31M as a starting battery to power all our electronics and it’s been great. Read our review here. Northstar batteries are known to be very popular for fishing boats. The pure lead AGM design is made in Missouri and is durable and resistant to heat. When compared to some other batteries of the same price and quality the Northstar has a faster recharge. This one has gotten tested against a few other batteries and nine times out of ten the Northstar AGM charges to 100% faster than the competitors. This battery delivers continually strong CCA and always turns over quickly. With this AGM battery, you don’t typically have to worry about getting stranded out on the water. This battery is dependable and always fires up when you need it to. As with the other AGM batteries, it is entirely maintenance free. No checking water levels or cleaning corrosion off the terminals. The battery maintains itself and is durable when stored over long periods of time and holds up in extreme conditions. Northstar also offers an excellent warranty depending on what kind of battery you get. Typically, they last between three and four years. Reviews for this battery are good, people have a lot of great things to say about the life cycle and overall power of this battery. Due to its size, it is able to turn over a much larger motor than the competition and to do so even after a long day of use. It holds a longer charge than the competition as well. The only downside to this battery is the overall size. It is a very heavy battery weighing up to 75 pounds depending on which one you get. In exchange for weight, you get a durable and reliable battery. Trojan Batteries are known well for their performance over long-term use. The company has a long history of producing quality batteries. Trojan has a ton of eco-friendly benefits factored into their battery design as well. These batteries get designed with an exclusive grid technology that reduces the effects of corrosion and deterioration of the battery. Since the Trojan batteries are designed using AGM technology, they are built to last longer than solid lead batteries. This feature promotes a quality charge and lower operating costs for you. Reviewers of this battery say it lasts long and performs as well as expected. People also say that the corrosion benefits are significant when the battery gets exposed to adverse conditions like rain and moisture. The only complaint associated with the Trojan batteries is the lack of variety in choices and sizes. If you need a specific type of battery, you may not find it with Trojan. This battery from Universal is maintenance free and requires no checking of levels or water due to the AGM design. The sturdy build reduces the risk of shock and vibration associated due to excess movement. It also comes with a one-year warranty, but the batteries are known to last between 4-6 years typically. The reviews on this battery are primarily good. Most people say that they are impressed by the life cycle of this battery. Reviewers state that even when tested, the battery lasts all day long and still recharges quickly. You can’t usually ship wet cell batteries, so you’ll have to pick these up in-store. I have personal experience with Interstate and EverStart Maxx, both are good, cheap lead acid options that should last at least 2-3 seasons if properly maintained with a good marine charger. Duracell is obviously known and trusted for making high-quality batteries, this extends into deep cycle marine batteries as well. This battery is high performing and does very well with your fishing boat. Duracell offers a 12-month replacement warranty and the battery is very simple to set up and get running. The battery is designed to be sturdy and wear resistant. The manufacturer has also taken measures to make this battery resistant to corrosion and excessive damage due to weather. The external part of the battery is built to be rugged and vibration resistant. This extends the overall life of the battery and makes maintenance simpler and faster. The battery actually has a built-in handle to make transportation easier and safer. With 800 marine cranking amps, this battery has the ability to turn over some pretty powerful motors. For a battery of this price, this is a great and affordable option. There are a lot of reviews online raving about the quality of this Duracell battery. People are impressed by the overall life cycle of the battery and how affordable it is. Most reviews claim they get up to six years out of each battery and for the price, that is a great bargain. Reviewers also have good things to say about the customer service from the manufacturer, if there is an issue the customer service department at Duracell is great at handling the issue and resolving it quickly. 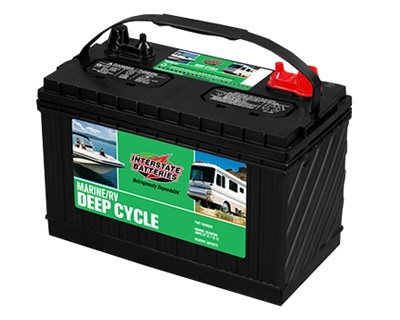 Interstate has some of the best marine batteries out there. This reputable company has a long history of producing high-quality marine batteries that are popular with anglers everywhere. They are popular because of their reliability and low maintenance. This is a pure, non-alloy lead design with some of the most advanced technology included. In comparison to the competition, this battery has a super-fast recharge and a very long lifespan. Even when stored for long periods of time in adverse weather conditions, the battery turns right over when charged. The AGM design keeps all the components safe and snug inside the case preventing any leaking or corrosion. The manufacturer also offers a nice three-year warranty, they replace the entire battery if anything goes wrong. This battery is built to be sturdy and resist any form of vibration or shock. The reviews for this battery are fantastic. Everyone is very pleased with the quality of this battery and they say the life cycle is great, the speed of charge is excellent, and the ease of use is perfect. This Interstate battery is very popular among anglers. The only negative thing that is said about this battery is that it’s a little bigger and more difficult to install. The price is also a point of issue with this battery, but you get what you pay for. This varies from battery to battery. Some people claim to be able to get as many as 10 years from one AGM battery, whereas others state only getting 2 or 3 years. It depends a lot on the individual battery. Another big factor that determines how many seasons you get from your AGM battery is the charger you use. If you invest in a great charger that is recommended by the battery manufacturer you have a higher chance of getting a longer life cycle out of your battery. 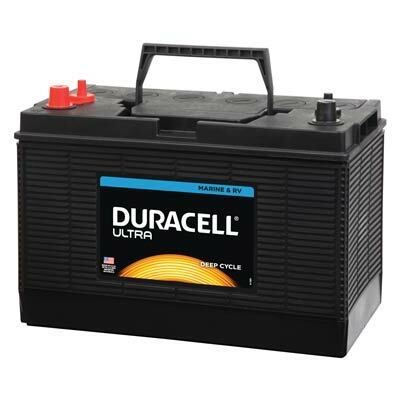 Deep cycle batteries are designed to discharge their power over a long gradual period of time. This is perfect for trolling motors because you may be out on the water for 8 or more hours. For this to happen using a rechargeable battery, you need something that is going to last a large amount of time. Regular batteries will exhaust all their power too quickly whereas deep cycle batteries will ensure you do not get stranded on the water. It depends on the battery, but it typically ranges from 30 – 116 depending on the size and voltage of your battery. The larger your battery the longer it runs. Typically, for every 25 amps of battery power, you get 4 hours of running time. Every manufacturer recommends a specific charger but its most important to have a charger that has enough amperage and is compatible with an ABM battery. It’s always best to take the recommendation from the manufacturer though. This helps to extend the life of your battery and give you an overall better experience. Battery warranties are important because you want to make sure you are covered in the event that you need to be. More important than warranties though, are user reviews. Be sure to do your research ahead of time before making a purchase. Some companies offer warranties as long as 5 years and others only offer a few months. If the battery has good reviews and a short warranty, that may mean the quality of the battery is good and the company is confident in that. Often times you can find this on the battery or the manual if you still have it. A quick good search should also reveal a better way to find it on your specific battery. If you are looking for a low maintenance battery with a longer life cycle than a wet cell, then yes. AGM batteries are going to cause you fewer headaches over the long term. It’s definitely an investment in peace of mind.